The Pendleton Round-Up — which celebrated its centennial last weekend — did not become one of the West’s oldest, biggest and most beloved rodeos by bucking tradition. The arena where it is held just underwent an $8.5 million renovation, but the bulls still burst out of weathered old wooden bucking shoots. The names of corporate sponsors are not splashed on the arena walls. No motorized vehicles are allowed at the “Westward Ho!” parade that coincides with the rodeo, only people and horses and wagon wheels. Even rodeo riders are impressed with the frontier authenticity of this high-desert town in eastern Oregon. And that, some Indians say, can be a problem. Some are offended by the sun-scorched bleachers where they get to sit for free (anyone can pay to sit in the shaded grandstand). 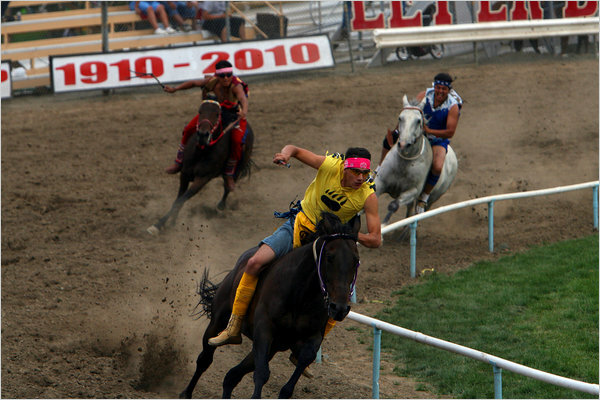 Others are uncomfortable with Indians’ daily appearances in traditional dress in the rodeo arena — where they are applauded but not expected to stay long. Some say the Round-Up sends mixed signals to the Native Americans who have lived here for thousands of years: we want you, in your place. That is an attitude with plenty of Western tradition as well. One Indian woman, gesturing toward those in the Indian section on a hot afternoon, said, “It’s a subclass.” "